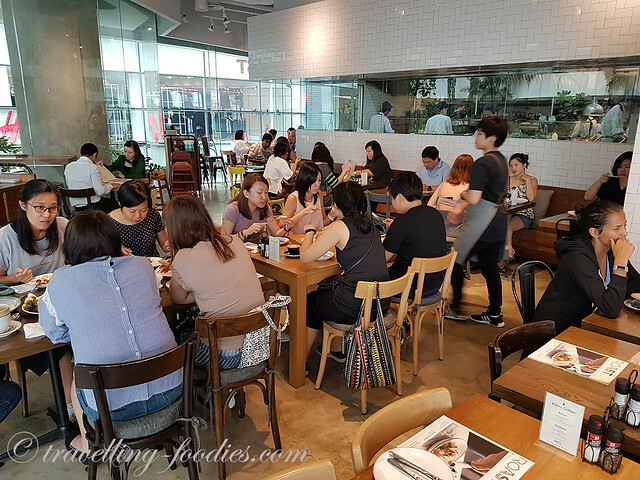 The ‘flagship’ cafe for Roast is actually located within the hipsterish district of Thong Lo but that outlet is quite a walk from the BTS station so we settled for “second best” at their branch nested in EmQuartier. The ambience in Roast is pretty much like Vanilla and Greyhound, relaxed, large and spacious, full glass pane windows with lots of lighting. We opt to be seated in a “semi-alfresco fashion”, i.e, facing the huge glass panels but still well within the comforts of air-conditioning, an absolute must in crazy hot Bangkok not unlike Singapore. Ordered two of their signatures to share and the first seemed immensely popular. 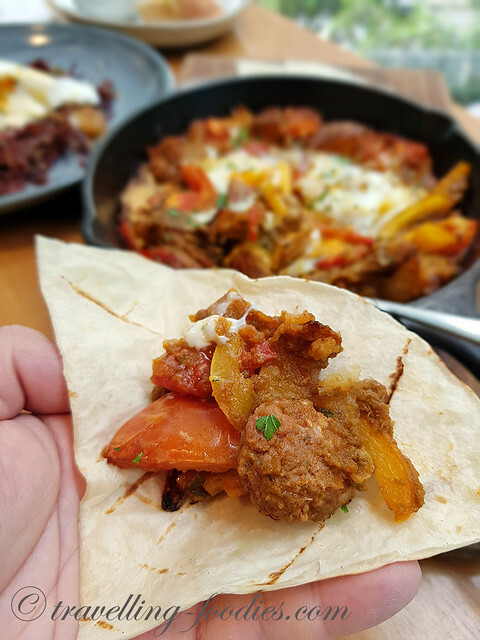 Huevos Rancheros (THB 350) is a classic Mexican peasant-farmer breakfast kinda dish (“Rancheros” echoes with the word “ranch”) of sunny side ups as mains served with a melange of baked beans, corn, onions, chilies and well-seasoned meatballs in a tomato-based sauce and some tortillas on the side. 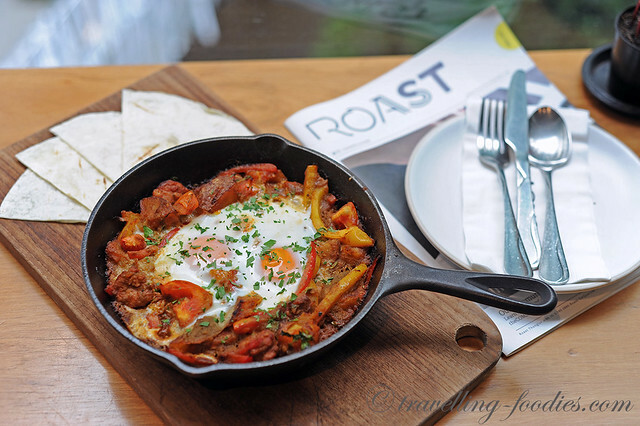 The appeal kinda reminds me of Shakshouka but seemingly with a lot more going on in the pan. 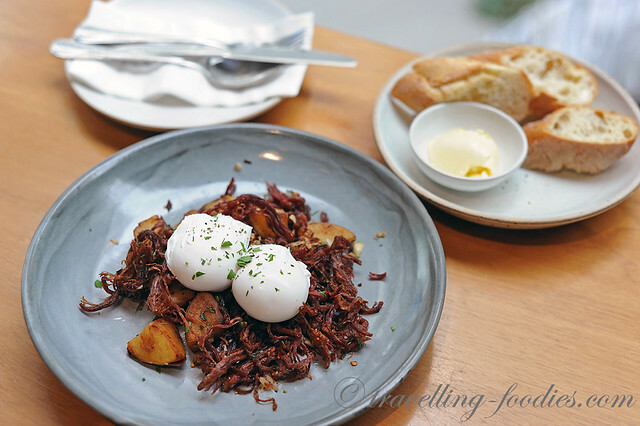 Then there is the Corned Beef Hash (THB 280) but the version at Roast looked and tasted more like a well-roasted beef brisket until fork tender and then gently pulled apart instead of regular corned beef from the can. I’m not complaining because I very much prefer the former, with lots of effort and lots more flavour. 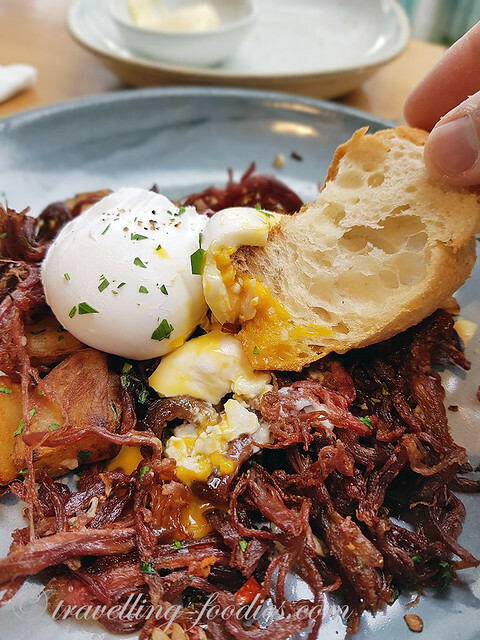 The pulled beef is then sauteed with chunks of parboiled potato with the latter being deliciously crisp and golden brown on the outside while the innards are soft and fluffy, textural contrast that works perfectly up my alley. 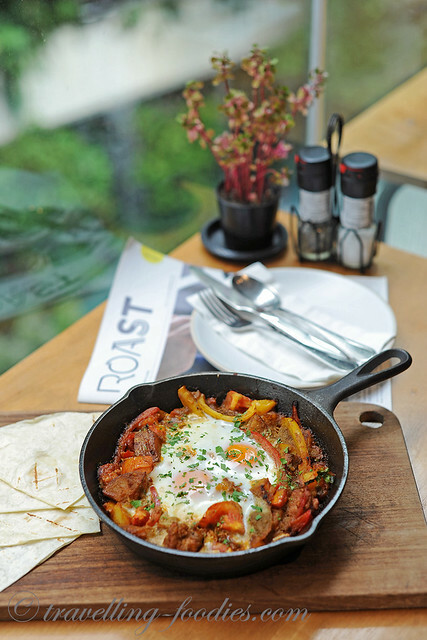 We tried the Heuvos Rancheros first with the flatbreads. Interesting but without surprises. I enjoyed the dish but it was a tad too spicy for J. We tried to replicate the same yolk-dunking action with the poached eggs on the corned beef hash but it wasn’t as orgasmically gratifying as with the Huevos Rancheros as the eggs here were kinda overcooked. I didn’t like how rubbery the whites were as well, a curse with too many a poached eggs I’d had before when the cafe is too zealous with the vinegar. But we enjoyed the pulled beef and the potatoes, secretly hoping for the former to be sandwiched between two toasted brioche buns with a generous amount of greens and perhaps some sliced gherkins. Mega yums it would have been but alas it was not meant to be. Still a pretty enjoyable dish nonetheless, though probably it would have been better to let the service staff know if you like your poached eggs more runny or at least soft-boiled-ish like us. The ones we’d had were almost cooked through, a small mishap which would have otherwise made the dish near perfect. Sous vide eggs would have worked a whole lot better in this dish. We walked into the cafe when it had just opened for the day and we were so glad that we did as the brunch crowd soon poured in and the cafe was almost full in no time. A good mixture of local and foreigner crowd like us, mostly here just to chit chat, chillax and enjoy some good food and perhaps a cuppa. Some hits and misses with the food but we like the ambience and perhaps would be back in the future to try out the rest of their menu, hopefully at their Thong Lo joint. 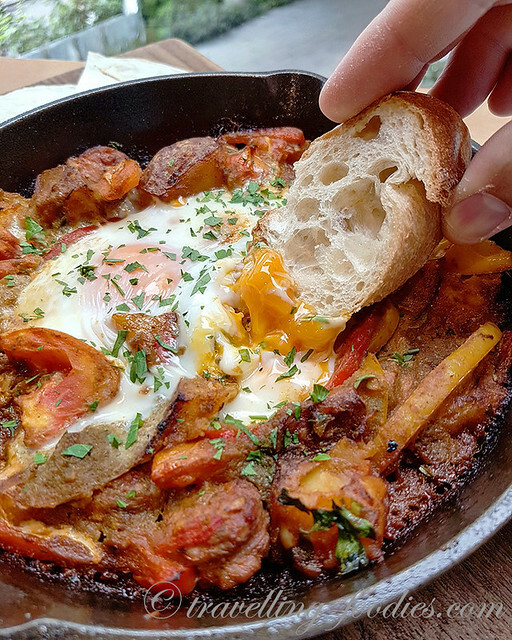 This entry was posted on June 5, 2018 by Alan (travellingfoodies). 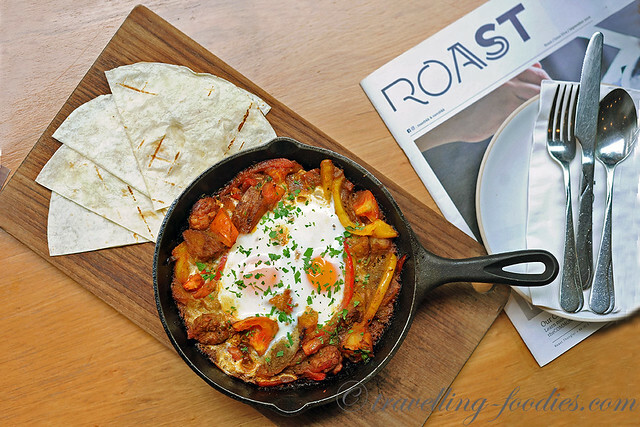 It was filed under Food, Travel and was tagged with baguette, bangkok, corned beef hash, EmQuartier, flat bread, huevos rancheros, poached eggs, roast.